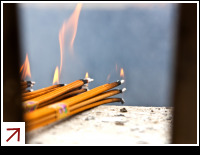 Qingming or Tomb Sweeping Day is a day dedicated to paying respect to family ancestors. The holiday usually falls in April and on the 15th day of the spring equinox. Families travel to their ancestors’ graves to clean the sites, plant new flowers, pay respects and to offer food. The festival was merged with the Pure Brightness Festival which originated during the Spring and Autumn Period (770-476 BC). According to legend, a loyal official by the name of Jie Zitui was overlooked by Emperor when rewards for loyalty were being awarded. Jie fled to the mountains with his mother. The Emperor was reminded of his mistake and ordered Jie to be found and properly acknowledged for his loyal service. However, Jie was nowhere to be found. Some of the officials suggested that the Emperor set fire to the mountain to smoke Jie down. But after the fires were extinguished Jie and his mother’s bodies were found beside a burnt willow tree. Overcome with shame, the Emperor ordered that day to be a day of eating cold food (Hanshi Festival) in memory of Jie. Only cold foods could be eaten on that day, and no fires were to be lit. The following year, the Emperor went back to the willow tree which to his surprise was in full bloom with beautiful white flowers. The festival was then renamed Pure Brightness Festival. The two festivals were merged and later the tradition of commemorating one’s ancestors were incorporated to what is known as Qingming today. Since the festival occurs at the onset of spring, celebrating the festival also means celebrating the arrival of spring after a long winter. Seeds are sown, kites are flown and excursions into the countryside are commonplace. If you are travelling in China or other Asian countries with large Chinese populations, it’s a good idea to bear in mind that roads can be quite congested and public transportation quite crowded. When is the Qingming Festival in 2013, 2014, 2015, 2016, 2017? We currently have no tours and holidays that match your search. However, please get in touch with us and we’ll be happy to help you.